This year M2M and IoT are two of the most heard keywords in our technological domain. One of these is fresh new, I mean a couple of year old, when the other one is pretty much older. M2M, standing for Machine to Machine is a capability for two machines (or more) to discuss together and take actions. Like a temperature sensor allowing your boiler to decide when to start or stop. In the industry where automatism are in place since many year, M2M is something in place, running, not new. IoT, standing for Internet of Things is part of the M2M technology but actually raising. In IoT the main word is Internet and it stands for the capability of an object to talk over Internet on its own. Why only now ? mostly because now it starts to be possible. My last post was about a demonstration of what you can do in 5 minutes with MQTT. This video was part of a global MQTT presentation I’ve done for Clermont’ech APIHours. Here is a full version of this talk in English. For French reader, the video of the talk in French will come soon as soon as Clermont’ech team will finalize it. 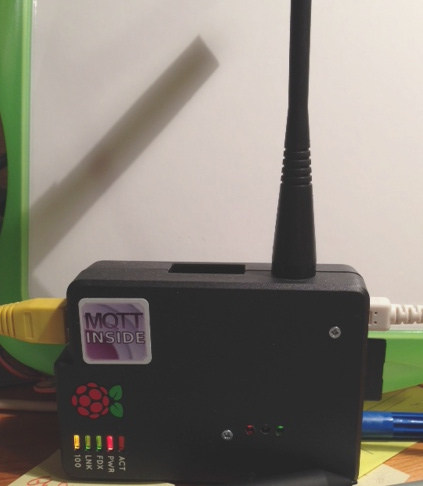 To prepare a presentation of MQTT for tomorrow, I just finished a MQTT / Mosquitto demonstration in a 4 minutes video. Enjoy ! In different previous post, I explained what is SigFox technology (a radio-communication system made for Internet Of Things, allowing a sensor to communicate with servers on Internet at an affordable price) and how to send data from a sensor to the SigFox backend. This new post is explaining how to configure this back-end to get the sensor data loaded in your system and create your own application. SigFox is a French radio frequency technology allowing a really low cost data transfer from Machine to Machine. Compared to GSM, this solution have some great advantages : it costs only 10-16€ per year and the energy consumption is about 1000 time less. For sure there is some constraint and the main one is the quantity of information you can transmit. In fact you have a limit of 150 sent messages / days with a length of 12Bytes. It’s not big but is it enough for a lot of IoT and M2M applications. This technology works as a modem you can connect to any platform like Arduino, RaspberryPi. The chips are provided by TelecomDesign from a cost about 15€. The starter kit is about 150€ here. The great advantage of this technology, in a operator point of view is the low density of the architecture where you need only 1000 antennas to cover a territory like France. As a consequence, at this time, already 90% of the country is covered by this technology. Yesterday, I was in Grenoble for the Eclipse IoT days. It was a great opportunity to listen and learn from some actors of the IoT movement. The day was on the campus where we have been invited to see some student work on home automation and robotic for telepresence (see my twitter photo feed). The day was intensive on conferences with the really good quality and interest. Most of the discussions / demonstrations were based on Home Automation, Smart house and globally telemetry. Not many industrial applications has been shown but some of the companies are working on industrial domain. Most of what has been shown is applicable on industry. – Java for the management platform running the OSGi platform (Java) (this is also due to the fact Eclipse were organizing the conference and OSGi is Eclipse framework) This OSGi framework integrates management tools to connect / upgrade the platform remotely. – A custom MDM solution is deployed to manage the platforms (generally based on server management solution instead of MDM solutions) like roboconf. Regarding the different architectures, some maintain the data on site with a in-house user interface, some export data outside on “cloud” with an on-Internet user interface. As much as I’ve seen the in-house strategy is largely loosing on performance and interface quality due to the limited power of the management platform to perform advanced HTML experience. I assume this is also related to the Java choice to run these applications. The other interesting learning is that most of the companies are using Raspberry Pi and Arduino to prototype solutions before, I assume, building a more robust platforms. Opensource is also mainly used and presented as the only solution to make the IoT market based on standard to be integrated all-together.